The Wright family stands in front of their log house in Denmark Township. Settlers were attracted to Denmark Township as soon as the land was open for settlement in 1838. The point of land between the Mississippi River and Lake St. Croix was a natural stopping place for travelers. Almost immediately a settlement known as Point Douglas grew up at the river junction. Joseph Monjeau built the first log hut in the Point Douglas area in 1838. In 1840 entrepreneurs Levi Hertzell and Oscar Burris opened a mercantile store; the following year they acquired the first post office in Minnesota outside of Fort Snelling, with Hertzell as postmaster. Their store became the major supplier of goods for the interior. David Hone, one of 13 men who had started the Marine Mill Company, moved to the point in 1843 and built the Union House hotel. Other settlers soon followed, many opening up farms in the interior. In 1849 Hertzell, Burris, and Hone platted the village of Point Douglas, naming it for Senator Stephen Douglas, who had been instrumental in forming the Minnesota Territory. The settlement had a school from 1844 when Sarah Judd began teaching in the William Dibble home. Valley School was officially organized in 1850 and a log building erected. By 1858 Point Douglas was a thriving lumbering and supply center with a busy sawmill handling logs floated downriver from the forests up north, a church, a school, two general stores, a post office, a blacksmith shop, two hotels, 15 to 20 homes, four warehouses, and ferry service to Hastings and Prescott, Wisconsin. Point Douglas was the regular stopping place for steamboats to take on wood for fuel and to transfer passengers and freight bound up the St. Croix Valley. When the supply of big trees ran out the village gradually faded away, becoming a ghost town by the end of the 19th century. Agriculture replaced the lumber industry in Denmark Township. By 1846 farmers were able to haul their grain to Afton for milling. The Whitaker farm on the bluffs overlooking the Mississippi river is the oldest family farm in Minnesota, according to the Minnesota Historical Society. 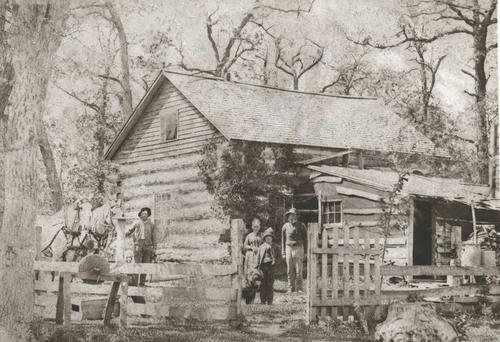 Ephraim Whitaker came up from Kentucky and built a log cabin in 1846 on the outskirts of Point Douglas. By 1854 he had constructed a large house, the second floor of which was used for community socials, dances, and meetings. In 1864 the township’s largest operator was Oliver Dalyrymple, who farmed 2,000 acres in Denmark and Cottage Grove. Basswood Grove was a promising community that once stood on St. Croix Trail. Basswood School, built in 1854, and St. Mary’s Episcopal Church, organized in 1863 by Reverend Wilcoxson, became the nucleus of the community. By the 1870s John Olson had opened a store nearby; a second store was opened by Samuel Dangerfield in 1874, but it burned two years later. In 1876 Asa Clothier built another store that was also used as a town hall and post office. His son Edson later operated a feed mill at this location. Early settlers depended almost entirely on the river for transportation. A ferry established between Point Douglas and Hastings in 1849 was replaced in 1895 by the spiral bridge that connected Denmark to Hastings until 1951. A ferry ran between Prescott and Point Douglas from 1851 until it was replaced by a bridge in 1923. In 1850 Congress approved funds to construct military roads in the territory, two of which started in Point Douglas. One ran through Stillwater to the St. Louis River; the other through St. Paul to Fort Ripley. The Point Douglas–St. Louis River Road, completed in 1858, generally followed the line of Oakgreen Avenue. It saw much pioneer traffic until it was replaced and obscured by development of the section-grid road system. In 1879 the first railroad line, a branch line of the Chicago, Milwaukee & St. Paul Railroad, began making daily runs along the river from Hastings through Point Douglas to Stillwater. The “Peanut Line” operated until 1978. Over the years wheat farming has given way to more diversified farms and semi-rural residential neighborhoods. Today apple orchards and berry farms attract hundreds of visitors. The township is blessed with many parks and recreational areas including Point Douglas Park and Beach, St. Croix Bluffs Regional Park, Carpenter Nature Center, Afton State Park, and Afton Alps Ski Area. Denmark Township has no village, no post office, and no schools. Residents’ mailing address is Hastings, and children attend school there, across the Mississippi river in Dakota County. The population reported in the 2000 census was just under 1,350.